Set of 6 kitchen utensils - slotted Spoon, pasta spoon, serving spoon, spatula, draining spoon and ladle. VINTAGE used Portmeirion Pomona Placemats 10” diameter Ok used condition but slight damage as seen on the plum. 1 shallow bowl;. - 6 dinner plates;. White porcelain with multi-coloured pattern. Each plate depicts a different flowering plant. Each bowl also depicts a different flowering plant. As the UK's number one heart charity, the cutting edge research we fund has already made a big difference to people's lives. Portmeirion - Botanic Garden - Butter Dish - Cyclamen. Dispatched with Royal Mail 2nd Class. This nice baking dish features the botanic motif 'Garden Lilac' together with sprigs of 'Treasure Flower' around the outside edge. It has an unglazed base to facilitate use in the oven. There is a (easily removed) black line to indicate the marginal fault which is a slight mark on the base but it is fully glazed. New (second quality) and in very good condition. This pretty tea towel features the botanic garden motif 'Treasure Flower'. Botanic Garden range. 26 cms x 12 cms. CODING AT THE END OF THE TITLE IS FOR INTERNAL USE ONLY. What you see in the photo's is what you will receive. Portmeirion Botanic Garden Sweet William Pasta Bowl (Approx 8.5" / 21.5 cm). These are from the 1990s and have not been used but the wax scent and colour have faded. PORTMEIRION ~ VARIATIONS BOTANIC GARDEN ~ COVERED SUGAR BOWL. Many, if not all, linens will also have a laundry mark - either in indelible ink or embroidery onto an edge or a corner. 5 out of 5 stars - PORTMEIRION ~ VARIATIONS BOTANIC GARDEN ~ COVERED SUGAR BOWL. 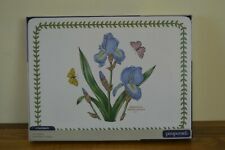 1 product rating1 product ratings - PORTMEIRION ~ VARIATIONS BOTANIC GARDEN ~ COVERED SUGAR BOWL. Stunning Portmerion fruit bowl in lovely condition. All fruit patterns around outside and inside. No chips or cracks. Lovely for summer. Please see photos. I only post within uk and wrap very well. Thanks for looking. Portmeirion Botanic Garden Garden Lilac Salad / Dessert Plate Unused 21.50cm. Dispatched with Royal Mail 2nd Class. SOAP/LOTION DISPENSER. APPROX 18cm TALL X 15cm AT WIDEST POINT. This pretty older quality oval plate/platter features the botanic motif 'Dog Rose' along with it's wonderful large bumblebee almost never seen with another flower. The base is unglazed to facilitate use in the oven. The mug and Tin are decorated with the Sweet Pea ( Lathyrus Odoratus). The mug holds 12 oz. Aquilegia Gracilis /Slender Columbine on the top plate. BEAUTIFUL FLOWERS IN LOVELY BRIGHT COLOURS. Decorated with Passiflora Caerulea (Blue Passion Flower) and brightly coloured butterflies. All our products have been supplied directly from the manufacturer and are sold in their original boxes unless otherwise stated. Portmeirion 1 Cup Teapot Botanic Garden - Fireplace. Novelty. Very good condition. Get Free Quotes. This lovely large impressive and versatile bowl features seven different botanic motifs. Portmeirion botanic garden vase Condition is Used. Dispatched with Royal Mail 2nd Class. Although listed as used only ever been on display . Will be packed securely and I will not be responsible for breakage in transit as I have been scammed twice before so please be prepared to claim from royal Mail in the unlikely event that the item does not reach you in perfect condition. I have a few pieces of this pattern but these two bowls show no signs of use such as even cutlery scratches, so I have listed them as new. BOTANIC GARDEN SWEET PEA. 2 MUGS -. 34 L. (12 oz). 2 COASTERS - 10.5 cm square (4" square). The motif was retired many years ago around 1985. Botanic Garden. Susan Williams Ellis, Dishwasher, Microwave, Freezer safe. Beautifully decorated with flowers and butterflies. This really lovely set of older quality footed sorbet dishes each feature two different botanic motifs. Sorbet dishes were discontinued a number of years ago and are no longer produced. All six are marked with a Crest ID backstamp. The mug and Tin are decorated with the Hydrangea ( Hydrangea Macrophylla). The mug holds 12 oz. PORTMEIRION ~ VARIATIONS BOTANIC GARDEN ~ MILK JUG.